My nephew Michael loves having my mother and me in the house. Although I’d like to attribute his joy to our adorable personalities, I’m afraid that the real lure is, in Michael’s words, “cooking with sugar.” We tend to make delicious sweet things for and with him, particularly during the Thanksgiving and Christmas season. 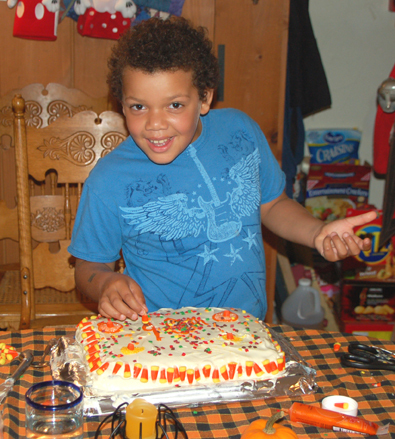 As far as I’m concerned, the sugar we cook with is really our boy. If you haven’t cooked with children lately, grab yours or go out and borrow one and head right into the kitchen. 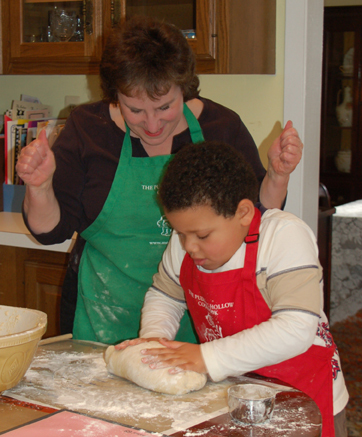 Kids remind us that sifting, kneading, and stirring can all be forms of play. 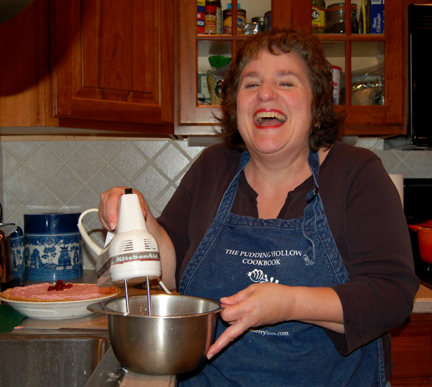 Young cooks tend to make a bit of a mess in the kitchen, but grownups almost always end up smiling as they mop up. Moreover, the junior chefs are usually game to help erase the marks of their work in the kitchen, especially if bribed with a home-made treat. Last Monday, Michael, his mom Leigh, my mother Jan, and I all got together to work on one of Michael’s cub-scout tasks, reading and following through on a recipe. Naturally, he chose to make something sweet–butterscotch brownies. This recipe is a great starter for kids because it takes only 15 to 20 minutes to get into the oven, and all of the prep work can be done in the saucepan with which you melt butter at the very beginning. 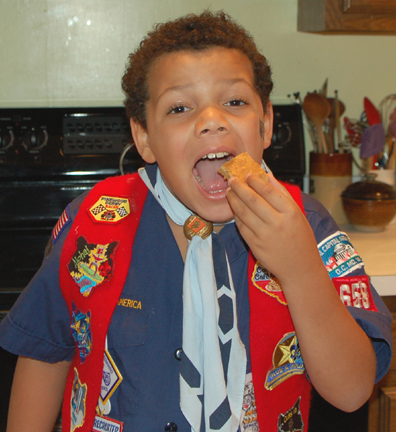 Michael proudly took the brownies to his scout meeting that evening. He did save one or two for home consumption, however! Preheat the oven to 350 degrees. Line a 9-by-13-inch pan with aluminum foil, and grease the foil as well as you can (it’s a little awkward to work with). In a 2-quart saucepan over medium-low heat, melt the butter, stirring frequently to keep it from burning. Remove it from the heat. Using a wooden spoon, stir in the brown sugar, being careful to crush any lumps in the sugar. Beat in the eggs, 1 at a time, and then stir in the baking powder and salt. Stir in the flour, followed by the vanilla. Spoon the batter into the prepared pan (the batter will be thick so you’ll need a spatula), and bake the brownies for 25 to 30 minutes, or until they are ALMOST firm to the touch. Allow them to cool on a rack; then slice them into squares. Makes about 32 squares (depending on how big you cut them!). I haven’t quite figured out how to adjust the audio settings; I know the sound quality or lack thereof will appall my audiophile brother. But days like Thanksgiving make me want to sing. Listen by all means (just click on the link below), and please don’t be too critical. I promise I haven’t yet given up my day job! Sing along if you like—the louder, the better. As my neighbor Alice Parker says, music should be something we make, not just something we consume. And that’s a simple gift for which we can all be thankful. The king and high priest of all the festivals was the autumn Thanksgiving. When the apples were all gathered and the cider was all made, and the yellow pumpkins were rolled in from many a hill in billows of gold, and the corn was husked, and the labors of the season were done, and the warm, late days of Indian Summer came in, dreamy, and calm, and still, with just enough frost to crisp the ground of a morning, but with warm traces of benignant, sunny hours at noon, there came over the community a sort of genial repose of spirit — a sense of something accomplished. Here are two additional dishes for Thanksgiving (I’m leaving the turkey to you). The pie may look a little complicated because of its multiple layers. It’s quite simple, however, and can be made the day before. The second layer comes out a lovely pink. Enjoy……. In an earlier post I said that I would come up with a non-box-mix-dependent version of Marilyn Pryor’s corn pudding. Here it is. Marilyn originally used 1 cup of cornbread mix instead of half of the flour, the cornmeal, 2 tablespoons of the butter, and the baking powder. You’re certainly welcome to do that if you have cornbread or corn-muffin mix in the house. One note: although the pudding looks gorgeous in the flat dish that appears in the photo here, it’s even better in a deeper pan, which keeps the pudding moister. Preheat the oven to 350 degrees. Butter a 2- to 3-quart casserole dish. In a large bowl, mix together the cornmeal, flour, baking powder, and salt. In another bowl, combine the onions, yogurt, eggs, and butter. Stir in the corn, and add this mixture to the cornbread combination, stirring just until the dry ingredients are moistened. Spoon the resulting batter into the prepared pan, and bake until golden brown and set in the center (about 45 minutes). Serves 6 to 8 as a side dish. I’m a sucker for cranberries at this time of year when we crave color and flavor. This pie is a little messy when you slice it, but I hate to add gelatin and make it stiff. If you want to make sure it will slice beautifully, use a graham-cracker crust; that way you can freeze the pie until half an hour before you serve it and keep it solid. My family likes goopy delicious things so we use a standard pastry crust. In a medium saucepan, bring the sugar and water to a boil. Add the cranberries and salt, and simmer until the cranberries pop (about 10 to 15 minutes). Basically, you’re making cranberry sauce so if you have a recipe you prefer feel free to substitute it here. Let the sauce cool to room temperature; then set aside 1/2 cup for the second layer and pour the rest into the pie shell. Next, create the second layer. With an electric beater, whip together the cream cheese, sugar, and reserved cranberry sauce until they are smooth, about 2 minutes. Add the cream, and beat the mixture at low speed until it is blended. Scrape down the sides of the bowl, turn the mixture to high, and beat it until the cream forms pink peaks (1 to 2 minutes). Spread this layer into the pie shell as well. At this point, you must refrigerate the pie, gently covered, for at least 3 hours. You may leave it for up to a day, however, if you want to make it in advance. 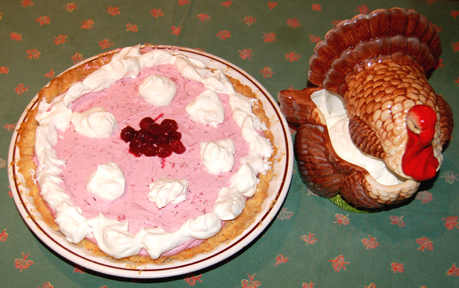 Just before serving, decorate the pie with whipped cream (or serve the whipped cream on the side.) Serves 6 to 8. I love to whip cream! 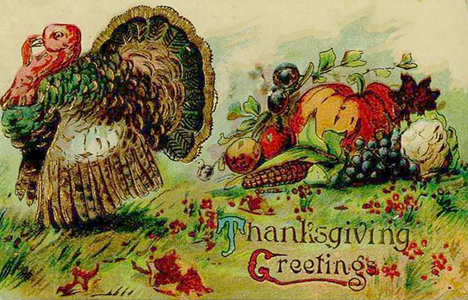 Like most of American history, our national Thanksgiving holiday is rich but complicated. The myth of the first Thanksgiving at Plymouth, Massachusetts, in 1621 has undergone challenges in recent years, thanks to new scholarship and to the inclusion of more diverse voices in the telling of the American story. We now know that the celebration wasn’t actually a religious Thanksgiving (which was more likely to involve fasting than eating) but more of a harvest festival. 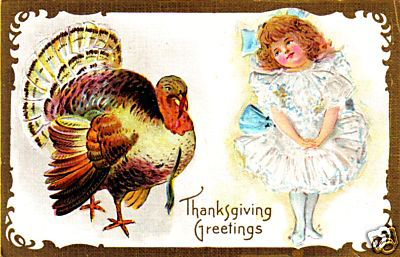 It wasn’t necessarily the first Thanksgiving in America; earlier challengers to this title have been identified in Texas, Florida, Maine, and Virginia. The settlers and Indians were as much keeping a wary eye on each other as offering friendship. Moreover, that event in Plymouth by no means started a regular tradition. 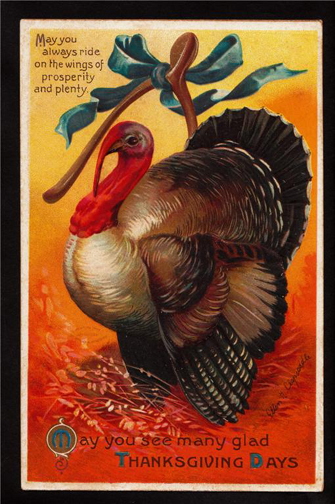 The Thanksgiving that we celebrate (including most of its menu) is more or less a 19th-century invention. Many American Indians justifiably resent the idea of a holiday that celebrates the survival of the English on these shores–and the help given to them by the Wampanoag tribe. Each year on Thanksgiving the United American Indians of New England organize a National Day of Mourning in Plymouth to remember the slaughter, intentional and unintentional, of Native Americans by European Americans. I don’t want to downplay the importance of any of these challenges to the traditional story of Europeans and Indians giving thanks while sharing the fruits of the harvest in Plymouth. I believe that history is most meaningful when it is most complete. Nevertheless, I do believe that what the capable curators at Plimoth Plantation carefully call “the harvest celebration in 1621” is an important story for all Americans, both as a real historical event and as a symbol. As a real historical event it commemorates at least limited cooperation between Europeans and Native Americans. Both before and after that date, the two groups (particularly the Europeans) were indeed trying to wipe each other out. During the early days of the settlers at Plymouth and particularly during the three days of the harvest festival in 1621, however, they shared food, shared an acknowledgement of the bounty of nature, and tried to some degree to communicate with each other. Like personal moments, historical moments may be great without being perfect. This was one such moment. The Thanksgiving story (not just the real event, but the myth) also shows us what a great people Americans can be together if we try to find commonality and share what we have. Abraham Lincoln declared the first official national Thanksgiving in 1863, during the Civil War. 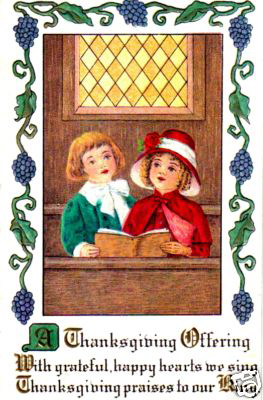 In his proclamation he urged his countrymen not just to give thanks on the fourth Thursday in November but also to use the day to ask God to “heal the wounds of the nation and to restore it as soon as may be consistent with the Divine purposes to the full enjoyment of peace, harmony, tranquility, and Union.” Thanksgiving is ideally about coming to terms with the good and the bad in our nation—and moving on together. 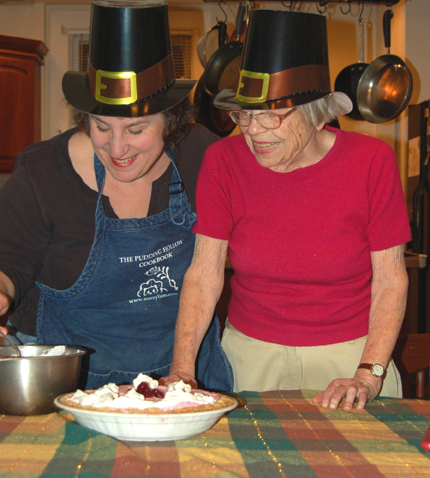 On a more local level, Thanksgiving brings families and communities together. Like the nation and the world, family members don’t always get along. 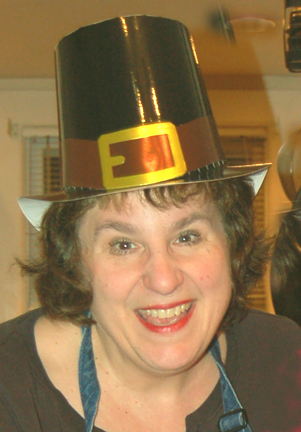 On Thanksgiving Day, however, we try to share goodwill along with the turkey and cranberry sauce. And we do our best to remember neighbors who don’t always have enough to eat by sharing with them as well, just as the Wampanoag and Puritans did. In this post and the next I’ll share a few of the dishes that will grace my family’s table this Thanksgiving. None of them is terribly demanding to make. I hope they help spread the Thanksgiving spirit. 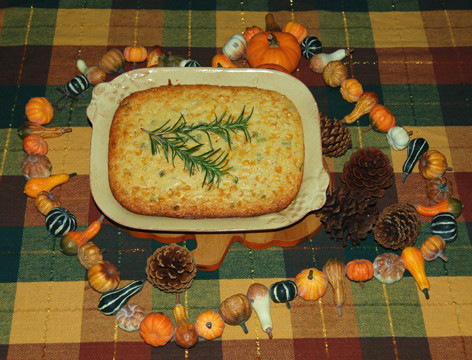 This simple, seasonal recipe comes from The Artisan Gourmet by Randy Tomasacci, a book I mentioned in my last post. Randy is the demo chef for Bittersweet Herb Farm in Shelburne, Massachusetts, and his new book blends recipes using BHF’s products with humorous stories from his life and cooking career. This vegetable dish is a real winner and looks gorgeous to boot. In case you’ve never prepared Brussels sprouts before, here are prepping instructions adapted from The Culinary Institute of America Cookbook: Cut off the ends of the stems. Trim off any withered or discolored leaves. With the stem facing up, cut a small incision in the stem of each sprout; this will help the vegetables cook more evenly. 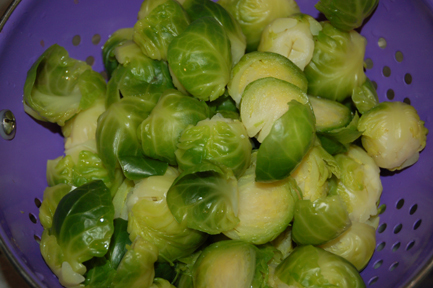 Soak the prepared Brussels sprouts in cold water until you are ready to cook them. NOTE: If you can’t find the Bittersweet products in time for Thanksgiving and want to make this dish on your own, you may play with ingredients. The oil is a mixture of canola oil and olive oil with lemon oil (you could use zest! ), bay leaves, peppercorns, and mustard seeds. You could probably get away with just the oil and lemon. The finishing sauce is soy based with a little water, canola oil, and lemon juice plus a trace of balsamic vinegar and herbs and spices to taste. Again, you could probably cheat with just soy sauce, water, and lemon juice. The overall effect is Teriyaki-like: yum! Blanch the Brussels sprouts for 3 minutes. Drain them and slice them in half. In a frying pan, heat the Lemon Pepper Oil, and add the sprouts to the hot pan. Sauté the sprouts until they are brown, reduce the heat to low, and add the Finishing Sauce. 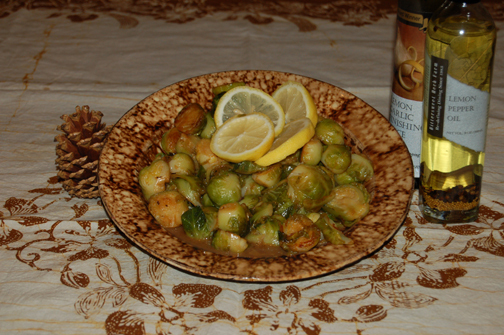 When the sauce is heated, remove the sprouts in their sauce to a serving dish. Serves 4. 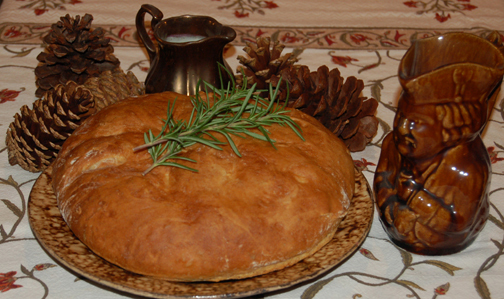 The sermon in my small New England church recently turned to bread and its many meanings. In Christianity and in common parlance, bread is the most basic human food, the food that stands for all other foods, both literal and spiritual. To me, bread is a symbol of fellowship. 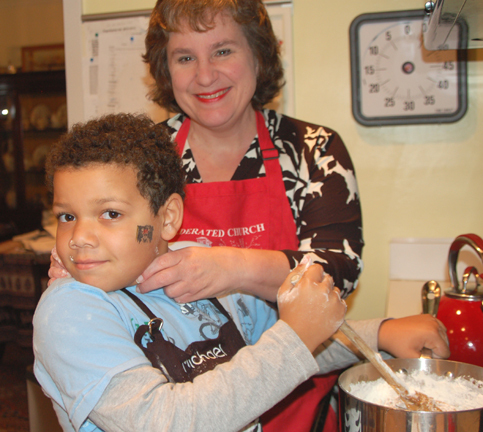 I often make it with my mother (the world’s best kneader), my sister-in-law, and/or my nephew Michael. As we knead the bread, we knead our relationships, gently stretching and binding them. Our laughter makes its way into the bread, making it healthy and happy as it rises. Bread is also a symbol of the power of the cosmos. Yeast, little creatures we can hardly see, work their magic and grow when given the right nourishment (a little moisture, a little warmth)—just as people do, just as the universe did during the big bang. My college astronomy professor, Tom Dennis, liked to use raisin bread as a metaphor for the expanding universe. He posited that humans are in the position of a raisin in a loaf that is rising. We cannot see the whole loaf of bread, but we know that the surrounding raisins are receding from us. Bread’s appeal is perhaps strongest when it exists only in potential form. In the oven, long before it can be eaten, it releases its glorious aroma into the house. Something about that penetrating odor always brings a longing to me that speaks to much more than food. The smell mysteriously promises to fulfill basic human needs —for home, for love, for nourishment. In an odd way, it reminds me of the Johnny Mercer/Harold Arlen song “Lullaby,” sung in the show St. Louis Woman by a woman recalling an idyllic childhood with a long estranged mother. The melody is haunting, and the overall feeling is of sad nostalgia. There with my head on her shoulder, the troubles of the world seemed far away. And yet it seems like only yesterday. We may not be able to revisit all the scenes of our childhood. Nevertheless, the smell of bread in the oven and that first bite of freshly baked heaven bring us back briefly to a time of innocence and wonder, when it seemed as though a kiss or a treat from a loved one could solve all of humanity’s problems. I was lucky enough to experience the aroma of fresh-baked bread Friday when I experimented with a loaf from a new book, The Artisan Gourmet, by Randy Tomasacci. Randy is the demo chef for Bittersweet Herb Farm. This company in Shelburne, Massachusetts, sells a line of high-quality herb mixes, oils, sauces, and vinegars. His book (which I’ll write more about soon) highlights those products with relatively simple recipes and humorous stories about his life and cooking career. 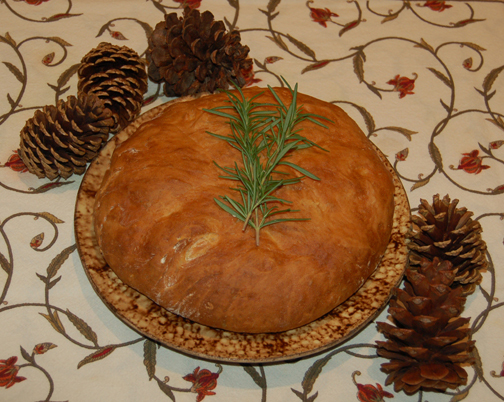 This recipe for a no-knead bread features Bittersweet’s Garlic with Rosemary Oil. You could infuse your own oil, but this one is pretty terrific. I started to add some fresh rosemary from my garden to the dough but discovered it didn’t need it. Randy didn’t specify what kind of pan to use for this bread. I shaped it into a flat ball before the second rising and placed it to rise (and eventually bake) on a parchment-covered cookie sheet. Between its aroma and its appearance, it took all my willpower not to gnaw into it before we took pictures! For more information on Bittersweet Herb Farm and Randy Tomasacci, visit the Bittersweet link on my blogroll. Dissolve the yeast in the warm water. Add the oil, the salt, the sugar, and 1/2 the flour. Beat for 2 minutes at medium speed. Scrape the sides and bottom of the bowl frequently. Add the remaining flour, and blend it in with a spoon until smooth. Scrape the batter from the sides of the bowl. Cover with a damp cloth, and let rise in a warm spot until the dough doubles in bulk (about 30 minutes). Punch the dough down, and dust it wih flour until it is no longer sticky to the touch. (This is when I shaped the ball.) Allow the dough to rise once more, again covered, until it doubles in bulk; then bake it at 375 degrees for 45 minutes, or until the top crust is golden brown. Brush the top of the loaf with olive oil, and let the bread cool on a rack. Makes 1 loaf.